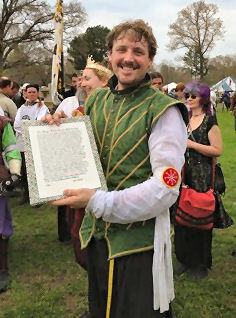 At Æthelmearc court today at Gulf Wars, Their Majesties Titus and Anna Leigh gave the second Æthelmearc writ for the Order of Defence to Don Orlando di Bene del Vinta. Their Majesties asked that all those from various Kingdoms who had been given a writ so far come to the front to witness the presentation, creating a stirring moment for the new Order of Defence peerage. The ceremony can be viewed here. The King, Titus Scipio Germanicus, and the Queen, Anna Leigh, to Orlando di Bene del Vinta, by the Hands of Timothy and Gabrielle, Don of the Order of the White Scarf, greeting. As a most just law, established by the careful providence of sacred council decrees with the coming New Year of the Society, a new Order shall be created. You know sufficiently well, and it is now, as We believe, divulged through all regions of the world, the study and practice of the art of Rapier. Now, however, not satisfied with the before-mentioned induction into the Order of the White Scarf, We have consulted with Our Heirs. Because, therefore, of your skill and interest We command you, strictly enjoining you in the fidelity and love in which you are bound to Us, the Kingdom of Æthelmearc and the Society as a whole, that you consult with Our Heirs and, you be present in person on a mutually agreed upon date and place; there to sit vigil to hear and contemplate the words of the people of this Realm and further, to be present along with you, those members of the Peerages and other inhabitants of Our Kingdom who would speak for you, to deliver your answer as to whether or not you would join the ranks of the newly created Order of Defence. Witness the King and Queen at Gulf Wars in the month of March, A.S. 49 in the Kingdom of Glenn Abhainn.